Operating inside the European Union? If a non-EU company operate inside the European Union (EU) with a non-EU registered aircraft, the company may have to import the aircraft into the EU and manage the exposure to EU Value Added Tax (VAT) and customs duty. You may already know this and you probably also know the old aircraft importation regimes in the United Kingdom and Denmark offering VAT exemptions ceased in January 2011 and 2010. The customs procedures related to customs duty (end-use exemption) changed drastically in 2015-16 and again late 2017. VAT treatment has also changed recently primarily in relation to leasing structures. This continues to leave many operators without a clear view of current EU aircraft importation issues and without the necessary knowledge to choose the most effective procedure for unrestricted access to enter into and operate within the EU. As VAT rates are between 17% and 27% and customs duty rates are between 2.7% and 7.7%, this is a very important aspect to consider before commencing or continuing EU operations. Please be aware that the descriptions of respectively Temporary Admission and full importation may be simplified and does not necessarily describe the full set of conditions. When operating an aircraft, you ONLY have the following options: Temporary Admission (TA) or full importation into free circulation. An operator does not have to file any paperwork if the aircraft is used by a third person established outside the EU and the aircraft does not carry any EU residents, conditioned upon the operator having full knowledge of the authorities’ practical usage and understanding of the TA Regulation in the various EU member states they plan to visit. If the aircraft has a more complex flight pattern or carries EU residents – or you just want to avoid any uncertainty when flying in the EU, inclusive of any uncertainty of what kind of flying you do; private vs commercial use of aircraft, we recommend using TA backed by local customs advice, the so-called Secure Temporary Admission procedure (STA). Please note: any aircraft flying into the EU must somehow come under EU customs control either using TA regulation or full importation, there is no other options. So, if the aircraft is NOT already fully imported, it will automatically be considered as flying under the TA regulation – see figure 1. 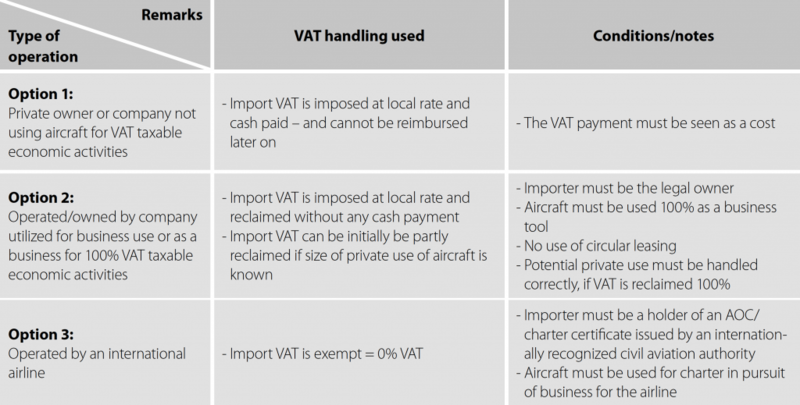 If the aircraft is not eligible for TA or is violating the regulation, the aircraft could be forced into a full importation, meaning paying the VAT and also the customs duty – see figure 3. To qualify for TA and be eligible for conditional relief of customs duties and VAT, the aircraft must be registered outside the EU and – as a basic rule – be used privately by a non-EU resident person or company. TA involving EU residents and/or commercial activities comes with certain restrictions and limitations but is possible. The primary intention of the relief is to grant the user free access to fly unhindered in the EU member states. If the conditions are met, TA is a paperless routine and admission is granted automatically when crossing EU borders – see figure 2. Some of the common issues surrounding the use of TA are discussed on the following pages. Please note that our Secure Temporary Admission procedure (STA) addresses most of the issues mentioned below. The definitions of ‘private’ use and ‘commercial’ use are specific definitions used by the EU customs authorities in relation to TA and should not be compared with similar definitions used by aviation regulators as these definitions are used in a different context. A flight deemed as ‘private’ use basically grants with a lot of privileges when flying in the EU whereas ‘commercial’ use may be restricted. The usual safe ‘private’ use definition is an aircraft owned by a private individual where the usage of the aircraft is solely private; such as flying with family and friends for visits and holidays and where the purpose of the flight is never commercially oriented. The working paper was based on 4 different cases and consisted of a description of each case supported by the EU Customs Code Committee’s comments and recommendations. Please note that the working paper is only an opinion from the EU Customs Code Committee and thus not binding on the EU member states or the European Court of Justice. An operator should be very careful when using the guidelines in the working paper without consulting customs authorities in the various EU member states they plan to visit. Is the use of Temporary Admission possible? 1) 28 EU member states, Isle of Man and Guernsey/Jersey. 2) San Marino is outside the EU Customs territory. ‘Natural persons who have their habitual residence in the customs territory of the Union shall benefit from total relief from import duties in respect of means of transport which they use commercially or privately provided that they are employed by the owner, hirer or lessee of the means of transport and that the employer is established outside that customs territory. Private use of the means of transport is allowed for journeys between the place of work and the place of residence of the employee or with the purpose of performing a professional task of the employee as stipulated in the contract of employment. It is not set in stone who is – according to the EU Union Customs Code – deemed a ‘user’ of an aircraft and whether there is any difference between EU resident passengers and the crew but working papers from the EU Customs Code Committee mentions that the above paragraph about EU-residents does only relates to the pilots meaning; there are no restrictions for EU-residents passengers. Particularly with respect to EU residents, some member states within the EU may have limitations and restrictions as to who may be carried within their borders and how. The entity responsible for the TA entry is called the declarant and should normally be the operator. The operator is, in general, the entity which employs the crew and provides services to keep the aircraft flying. If the aircraft is managed by a third party, the management company should be the operator. This is often a situation with a lot of pitfalls, as most aviation structures include many different entities such as user, owner, operator, lessee and lessor, etc. We regularly see a declarant nominated randomly and is therefore not a valid operator or sometimes a declarant is simply chosen because it is the only non-EU entity in the owner/operator/user structure. It is important that the declarant is acceptable as the real, physical operator and can prove this fact as well as claim responsibility as the operator. The declarant must, of course, be a non-EU resident. KNOW MORE: See survey 6: which entity is allowed to be the declarant? The aircraft must be registered outside the EU customs territory. The Isle of Man and the Channel Islands are part of the EU customs territory and, for that reason, aircraft registered at Isle of Man (M) or Channel Islands (2/ZJ) are considered ‘registered in the EU’. Aircraft registered in the EU are not eligible for TA and are thus not allowed to fly in the EU customs territory without the payment of customs duty and VAT – not even a single entry into the EU is allowed. All aircraft using an aircraft registration within the EU customs territory must be fully imported at the first port of call in the EU if not already imported. San Marino (T7) is not inside the EU customs territory hence TA may be used. The registered owner/operator mentioned on the certificate of registration must of course also be domiciled outside the EU customs territory. KNOW MORE: See survey 5: does the nationality of the aircraft registration matter? An aircraft assigned to the ‘private’ use category will be allowed a stay up to 6 months at a time in the EU. When the aircraft crosses EU’s external borders, a new 6 months period will begin. The TA regulation cannot be used if the aircraft has its normal home base or is spending the majority of time at the same place in the EU. This would be considered circumvention and may result in the payment of customs duty, VAT and a fine. An aircraft assigned to the ‘commercial’ use category will be allowed to stay for the time required to carry out the transport operation, often referred to as ‘period of discharge’. An EU form is available for documentation purposes. This form is called the ‘Supporting document for an oral customs declaration’. Please be informed that very few customs officials are familiar with this form and lack experience in handling the form. You should make arrangements well in advance with a local handling agent if you want to use this form. KNOW MORE: See survey 7: how is the 6 months period of stay practically interpreted? KNOW MORE: See survey 8: what is the limit for multiple continuous stays at the same place? The aircraft can be used for any purpose, such as private, leisure, entertainment, business/corporate use (Part 91), and commercial group charters (Part 135) without any consequence for the customs/VAT handling but under the condition that the aircraft will be used in the EU for passenger transportation without any ticket fee. Many operators usually prefer to fully import an aircraft into one of the EU member states and settle VAT in order to be able to fly unrestricted in the EU. The import VAT can be fully paid, reclaimed or can be VAT exempt at zero rate – see figure 3. How the import VAT may be handled during a full importation? This option is the only alternative for the private owners/companies with activities which is not considered as VAT taxable economic activities like real estate, banking/finance, insurance, gaming, holding companies and other not listed activities. The import VAT must be paid and cannot be reimbursed later on. The procedure reclaiming the import VAT is available for aircraft owned and utilized by a company or as a business. As a rule of thumb – if it is a company generating a turnover at arm’s length prices and it will make a profit in the long term, the VAT due on the aircraft may be reclaimed upon importation. Reclaiming is conditioned upon the company being subject to VAT and the use of the aircraft being linked to the company’s VAT taxable economic activities. Any importers using this option should initial check what kind of activities the aircraft will be used for in the future and again check whether or not these activities are considered a VAT taxable economic activity in the EU member state where the importation is planned. It is always a good idea to continuously check that the usage of the aircraft is as planned and is still considered a VAT taxable economic activity. The definitions of the latter can change over the years, mainly due to recommendations from the European VAT Committee which are again based on judgements of the European Court of Justice (ECJ). The VAT procedure is the same for any EU established company in any EU member state. It is all based on national legislation however, the procedure requires paperwork which differs from member state to member state. Nobody should sign-up for this option without knowing the full set of conditions, the risks and the on-going demand for a detailed documentation for the correct use of the aircraft. Most EU member states have a period of limitation for 5 years but the relevant documentation must be filed for 7 years and must be shown on demand during an audit. Written approvals by local customs authorities or legal opinions are available and recommended in most cases. It is a common misunderstanding that it is acceptable to reclaim all of the import VAT even if the aircraft is only used predominately for business purposes. The general rule is that the import VAT can be reclaimed 100% only if the aircraft is used 100% for acceptable VAT taxable economic activities. Any person using the aircraft for private/personal/entertainment purposes must compensate the importer directly for the use – otherwise the importer will have to pay the “non-business” part of the imposed import VAT back to the VAT authorities. KNOW MORE: See survey 1: is the term “predominately used for business” accepted by various EU VAT authorities? The use of imputed income to compensate any private/personal/entertainment use of a corporate aircraft is generally not accepted and will not exclude an EU VAT claim. Please also be aware of the US use of SIFL will not solve the compensation problem as these values are often too low to be considered market-rate. It is also important to stress that most EU VAT authorities will not differentiate between non-business use in and outside the EU. This means that any non-business legs flown e.g. in the USA by an American Part 91 corporate operator will actually have an impact on the EU VAT handling if the aircraft has been fully imported in the EU and the import VAT has been reclaimed 100%. KNOW MORE: See survey 3: does the flight pattern/geography and size/type of compensation matter? The procedure with import VAT exemption is available for aircraft used by companies with an international airline (AOC or charter certificate holder). Some providers offer a procedure where one company is established to act as lessor and another company to act as lessee creating lessee ‘airlines’ without an AOC. However, that solution is not in line with EU regulations. In the latest decision by the European Court of Justice in a case referred by the Finnish courts, a charter operator with an AOC was approved for 0% VAT. It follows from this judgement that an AOC is generally a requirement to be recognized as an airline in the EU. Non-AOC holders cannot be considered airlines. Using the international airline procedure, no VAT is imposed, as the rate is 0%. Most EU member states, including Denmark and the UK, require the aircraft to be used for charter. Since the judgement by the European Court of Justice in the A Oy case, it has been widely accepted that a leasing company leasing an aircraft to an airline may also benefit from the VAT exemption as a supplier. The exemption is not limited to the immediate supplier. The entire chain of lessors/lessees, etc. will qualify if the end-user is an international airline. KNOW MORE: See survey 2: what does various EU VAT authorities require to accept an aircraft as VAT exempt? The Council Directive on the common system of value added tax (the VAT Directive) regulates the authorities right to claim and the companies right to reclaim VAT. Uncertainty as to the correct application of the provisions of the VAT Directive in the case of full importation of leased aircraft gave rise to consultations with the European VAT Committee back in 2013. Based on judgements of the European Court of Justice (ECJ) and opinions previously expressed by the European VAT Committee, the VAT Committee made it unambiguously clear that the importation of a leased aircraft is subject to import VAT and that neither the customs representative nor the lessee is entitled to reclaim VAT. Consequently, some EU member states have declined lessees domiciled in the EU access to reclaim import VAT arguing that the lessees have not incurred the costs of acquisition and do not, in fact, own the imported aircraft. In 2015, the Legal Division of the Danish Customs and Tax Administration published a draft administrative act pointing out that a lessee cannot reclaim import VAT. Based on input from the industry, the Danish Customs and Tax Administration identified that this approach – denying lessees to reclaim import VAT – led to situations whereby both the lessee and the lessor were denied the right to reclaim import VAT. The issue of the lessee’s right to reclaim import VAT – or lack of such right – was revisited by the European Commission in 2017, and once again the European Commission made it clear that the lessee did not have a right to reclaim import VAT. The risk of being denied access to reclaim VAT should also be taken into consideration if using circular leasing agreements. Circular leasing agreements that do not, in fact, change the ownership or do not, in fact, imply any transfer of the right of disposal of the aircraft have been banned and may be considered as circumvention in the EU. Please be cautious if the importer is not the real owner of the aircraft. Always ask yourself – which entity has the depreciation allowance and right of disposal of the aircraft? KNOW MORE: Read more about this issue on opmas.dk under “June 2017 news”. KNOW MORE: See survey 4: has a lessee been denied the right to reclaim/recover the VAT imposed during an importation? As per January 1st 2018, a civil aircraft can be imported for free circulation with relief from customs duties if the aircraft has been duly entered on a register of a Member State or a third country in accordance with the Convention on International Civil Aviation (ICAO) dated December 7th 1944. Importation with customs relief per January 1st 2018 is no longer conditioned upon applying for end-use procedure. Importation of civil aircraft can be made under customs relief by reference to the valid certificate of registration in the customs declaration for release for free circulation. Please note that the presence of the relevant certificate on board of each aircraft is mandatory. Even though the above-mentioned conditions are fulfilled, the customs duty can still be an issue in cases where an aircraft is smuggled in, wrongly or false declared through a full importation, if the aircraft is using TA but is not eligible for TA or is violating the TA regulation. KNOW MORE: Read more about this issue on opmas.dk under “October 2017 news”. If you want to see the differences in detail we suggest that you have a look at the OPMAS Quick Guides. These guides are showing limitations, potential liability, no-gos, and include procedures which continuously must be handled correctly. Everything is listed point by point showing what you can and cannot do – in a short and precise way. The below figures are based on the EU Customs Code (UCC) and various EU working papers. This is in our opinion the correct interpretation of the regulations but all EU member states have not necessarily implemented everything at present. Most non-EU operators will practically have the same flying privileges using TA as given under full importation as the few limitations does not influence the typical flight – see figure 4. Full importation includes a lot of potential risks and liability which nobody wants – and without any gain for the typical non-EU operator. An aircraft using TA can be used for any purpose, such as private, leisure, entertainment, business/corporate use, and commercial group charters without any consequence for the customs handling – see figure 5. Many non-EU operators can benefit from TA without any help from customs experts. We will, of course, be glad to assist in more complex cases and you are always welcome to contact us and hear about the options at no charge. We will send you our input to any questions the same day and quite most within 1-2 hours. We recommend using TA and, if your intended flights involve multiple legs inside the EU and you want to carry EU residents on board, we have our Secure Temporary Admission procedure (STA) whereby we can eliminate all risks. Please enquire. Many of the above points are often an issue when using full importation. Our advice has always been to ask for a ruling from the customs authorities before an importation in order to eliminate any doubt as the details of all cases are different and EU member states may have a different opinions. This applies whether you intend to do a full importation or use TA with a complex flight pattern: Always ask for an assessment notice from the authorities!